Just a quick note to share the fact that December 15, our deadline for signing up for an individual health insurance plan, either on-exchange or off, has passed. We had reached our decision the weekend before but I’d be lying if there wasn’t a bit of last minute discussion on whether we sign-up for a back-up plan. That said, we moved forward with Liberty and are looking forward to a good experience. We anticipate some level of inefficiency as we learn the process, and our providers get used to it, but are hopeful that Liberty proves to be the right option for our family. We look forward to sharing so others might be able to learn through our experience! Our approval to Liberty arrived with little fanfare in an e-mail on the Monday following the weekend we submitted our application. You will receive an e-mail below with your member number (removed in the image below) and your effective date. Your enrollment in Liberty begins on the first day of the month following your approval date. In this case we were approved on 12/11/2017 so our effective date was 1/1/2018, which works out perfectly with the expiration of our current plan. Your new friends Olivia and Ronnie welcome you with a brief video explaining what to expect to start your membership. 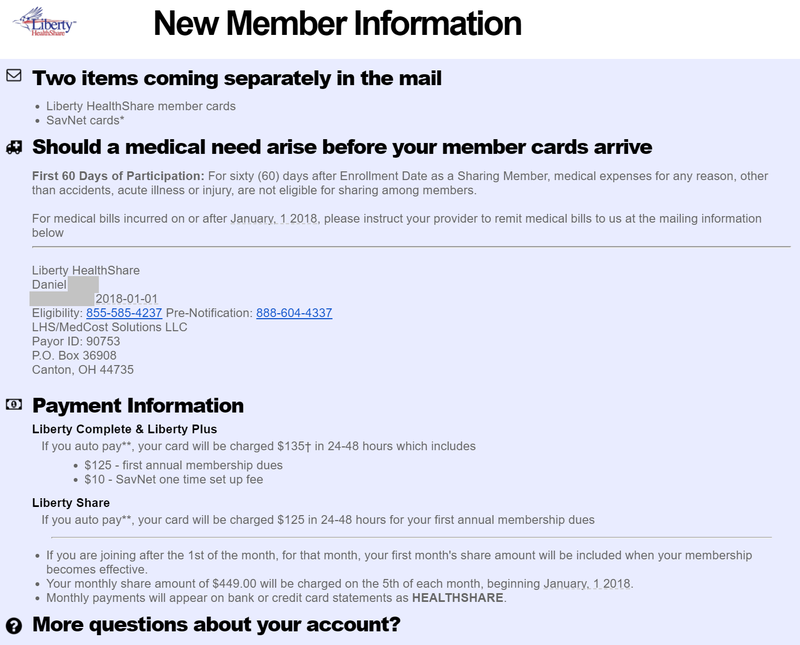 A day after the initial approval information you can expect to receive an e-mail with a bit more information on your membership. 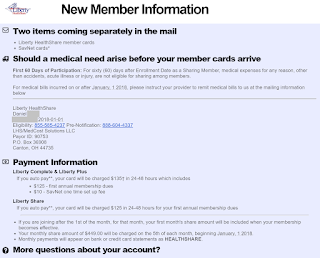 The e-mail below arrives and provides more information about your membership. It essentially summarizes the fact you’ll have cards arriving in the mail, what to do if a medical need arises and how payments will be processed. 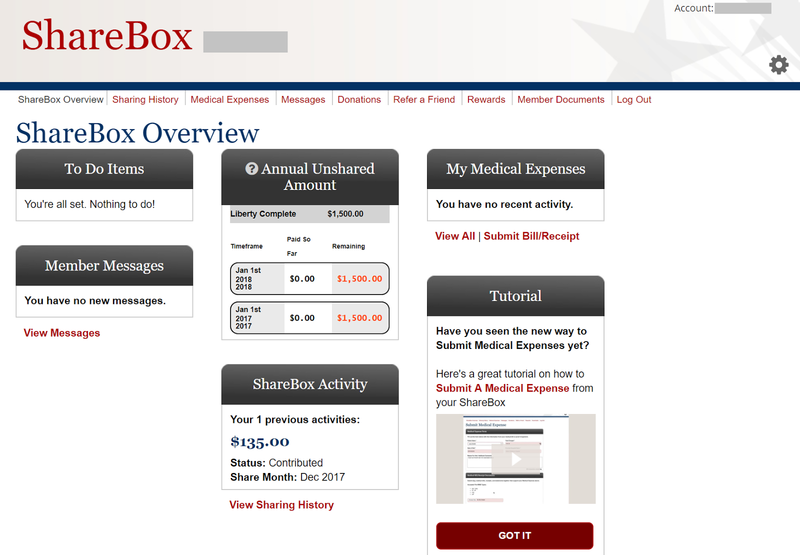 Under the “More questions about your account?” section there is a link to access your Sharebox as well as information on pre-existing conditions, which is consistent with what we learned prior to joining. While none of these e-mails are particularly thrilling our purpose here is to be as transparent with the process as possible so others considering this move understand what happens step-by-step. As of 12/17/2017 we have not received either our Liberty member cards or SavNet cards. We will share a post once we receive these items. Liberty Monthly Cost – Our monthly cost with Liberty is not just the $450 monthly share amount. In our situation we also needed to consider a) the $60/mo. we pay for dental insurance (but would be included in the Oscar plan we were comparing to), b) the $29 a month it costs to enroll in SavNet which was an option we chose and c) the $135 enrollment fee which is just over $11/mo if your prorate it ($135/12=$11.25). NOTE: I haven't corrected the analysis above but there is not an extra cost for SavNet. We are charged $449 a month and that includes SavNet. Thus, the monthly cost for Liberty would be approximately $520 as opposed to the $550. HSA Contribution – A HSA, or Health Savings Account, is an account that certain high deductible health insurance plans allow you to contribute to. It allows you to contribute money, tax free, to an account where you can invest the money or use the money for qualified healthcare needs. If you have no healthcare needs, or if you’d rather pay for those needs out of pocket, you can invest the money in your HSA to use for future healthcare needs (or even use in retirement!). These are great accounts and the plan we were evaluating with Oscar offered an HSA. In 2018 a family may contribute up to $6,900 in an HSA, while an individual may contribute $3,450. 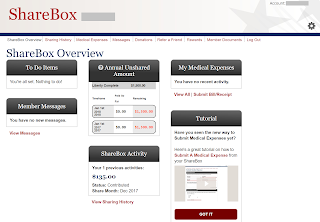 Tax Savings – There are no tax savings by enrolling in Liberty or any other healthshare. However, with traditional insurance, you can deduct the cost of your monthly premiums from your income as well as any contributions to a HSA. To calculate your tax savings from these deductions you need to estimate an effective tax rate (the % of dollars earned that go towards taxes). Using our estimated effective tax rate we estimated we would save approximately $5,845 in taxes by deducting our health insurance premiums and contributing the full amount to a HSA, which we did in 2017. Thus, our yearly cost for the Oscar plan being developed was actually $9,623 vs. $15,468. Is it worth it to pay $3,000 more a year, or $250 more a month, to have the comfort any catastrophic health care needs would be covered efficiently by a traditional insurer? Keep in mind this analysis did not take into account actual medical costs beyond monthly premiums. For example, in our situation, we would be responsible for medical expenses up to $6,500 for an individual and $13,000 for a family. With Liberty we would be responsible for costs up to $1,500. In 2017 our family had responsibility for approximately $3,000 in medical costs (after our insurers discount with the health provider). If we incurred similar costs in 2018 we would receive an additional $1,500 in savings by enrolling with Liberty. We would be responsible for costs over $1,500 if we went with the Oscar plan, whereas costs over $1,500 with Liberty are shareable (i.e. covered). When I started to think about 2018 health insurance options this fall I did not think about pre-existing conditions. We were fortunate and had none. In October I went for a routine physical that I try to do every other year. Everything checked out fine and I went for my blood work. The blood work was great other than one thing…high cholesterol. I now had a pre-existing condition and the blood work was the proof. While I am a healthy person, workout regularly, run half-marathons and feel great I must have had a diet that allowed too much cholesterol. Personally, I think it was my routine of having eggs every morning after working out – gotta get that protein. Nonetheless, it wasn’t off the charts bad but I was definitely flagged for high cholesterol. I didn’t panic, I’d focus on getting it under control with good nutrition but when filling out my application with Liberty I had to disclose the results of the test. Join their HealthTrac program for an additional $80/month. In this option, I would work with a health coach who would help address the high cholesterol. The benefit to this program, beyond the coaching, is that your issue is not considered “pre-existing”. The second option is to not join HealthTrac but then the high cholesterol would be treated as a pre-existing condition and any treatment related to high cholesterol would be treated according to their pre-existing condition policy (no reimbursement for the first year). I made the decision to not join HealthTrac. I feel I am healthy and I can control the cholesterol with some basic dietary changes. This will be a good test case to see if there are any instances in which a medical expense is rejected because it is related to a high cholesterol “pre-existing” condition. I researched these and came up with answers that were probably close enough for filling out the application but just a heads up that these questions exist. After completing the questionnaire your answers are automatically transferred to the actual Liberty HealthShare application. You will then be prompted to utilize DocuSign and electronically sign each part of the application (you and spouse if applicable). For the most part the application represents the questions you previously filled out but I recommend reading the fine print so you understand what you are signing. We found the fine print consistent with our understanding of what we were, and were not, signing up for. Prior to undergoing any significant procedures, there is an obligation to contact Liberty and notify them of the procedure that will occur. Upon hearing from the customer that a procedure will be performed Liberty contacts the provider to discuss pricing and attempt to negotiate prices. I asked specifically, about a scenario in which the discount offered a self-pay customer at a medical provider is not as high as Liberty would like. For example, the scenario I mentioned in my last post where I receive a discount of 35% as a self-pay customer but Liberty feels the discount would be 50%. I was assured Liberty would pay the bill that is submitted even if they did not have the chance to negotiate. The average time for reimbursement from the time they receive a bill to the time the customer receives money is 30-45 days on average. I’m looking forward to documenting how things work out against the expectations that were described. We are detailed oriented people so I feel we will have a good process in place to receive bills and submit payment. 1) We would be treated as self-pay customers. That is, the Clinic does not recognize Liberty as insurance, which they are not. This was not surprising to me and made perfect sense. If I was a major healthcare provider I would not submit bills directly to Liberty or treat them as if they were an insurer. My message to the customer would be the same as theirs to me – you are a self-pay customer, whatever you do to make sure the bill is paid is your business (my words, not theirs). We would call the provider and make an appointment. When we make the appointment, we would indicate we are self-pay. At that point in time they would provide us with an estimate of the cost. It was acknowledged that routine procedures like the check-up we were using as an example have a very accurate cost but surgical procedures would likely not be 100% accurate. In a surgical procedure, there’s more going on that could create variation. I get this. (P.S. Why does it take being a self-pay customer to get a cost estimate prior to receiving healthcare?). Once we went to the appointment we would be expected to pay for the estimated cost of the healthcare (check-up in this example). Based on my conversation with the healthcare provider you wouldn’t’ always need to pay the entire cost up front but at least a portion of the cost. Even for a check-up I imagine you could pay a portion up front then be billed. The required “pre-pay” amount likely varies based on services provided and the caregivers policies. We would receive a 35% discount on the list price of the procedure as a self-pay customer. This made sense to me. If we cut out the insurer, and the provider gets paid significantly faster, there should be a discount. I would argue it should be greater than 35% but perhaps we’ll find that’s negotiable. As you likely know, insurers negotiate discounts with healthcare providers within their network. With a traditional insurer, even if you have not reached your deductible, you will receive a discount on the provider's list price as long as it is in network. I compared the 35% discount to the discount our current insurer offers. The discount our insurer receives is greater than 35% but it wasn’t drastically more. So, yes, you’ll likely receive a greater discount from a traditional insurer but you pay for it through your monthly premium. In this scenario the healthcare provider would get in touch with Liberty (or more likely vice versa) and arrangement for payment would need to be made. The Cleveland Clinic (the healthcare provider I called) would not move forward unless there was assurances of payment. This is where Liberty would likely try to pre-negotiate the cost of the procedures with the healthcare provider (if they could). If there is a major procedure and the Clinic only offers me a 35% discount, and you feel there should be a 50% discount, who gets stuck paying the 15% difference? I mean how do I know they won’t just say the Clinic costs are not “fair and reasonable” and only cover a portion given they could not come to terms with the Clinic. I’ll document the response we got from Liberty in our next post. My wife and I became much more attuned to health insurance once I ventured into self-employment. Prior to this we’d make the yearly election for health insurance through my employer but frankly both options were great (compared to buying on your own!). We didn’t pay a great deal of attention but we did develop a baseline understanding of how insurance works (premiums vs. deductibles vs. co-pays, etc.). When I left my job we researched our options and, not qualifying for a subsidy, purchased a plan directly through Medical Mutual of Ohio, a local insurer. The cost was tough to swallow and we were relatively healthy so there was definitely a growing level of frustration. As my frustration grew my research into different healthcare options for the self-employed grew as well. It was this research that led me to the concept of healthshare ministries. At one point, prior to finding healthshare ministries I was describing a concept for health insurance to a friend: we would get a group of friends together, be self-insured and just help pay for each others insurance. It wasn’t a real plan, just one of those ideas you talk through out loud but leads nowhere. When I discovered healthshare ministries it sounded a little bit like that idea we had talked about. Would they really pay if we had a major health issue? Would our healthcare providers still see us without traditional insurance? How long would it take to get reimbursed for our medical expenses? Would costs suddenly increase or would the ministry become insolvent due to a sharp increase in medical expenses from members? These were some of the questions we tried to research prior to making a decision. The content on this blog will help share what we found…and are still discovering. My wife (age 36) and I (age 38) have three boys (ages 8, 6 and 3) and live in the Cleveland, OH area. We receive the majority of our medical care from the Cleveland Clinic. The Cleveland Clinic is an excellent hospital systems ranked nationally in multiple specialties. We also utilize the University Hospitals system in Cleveland for certain caregivers. We are both self-employed and do not qualify for subsidies under Obamacare. Prior to signing up with Liberty we were insured through Medical Mutual of Ohio, a Cleveland based insurer. Our plan included a $6,400 individual deductible and $12,800 deductible for the family. The plan was eligible for a HSA which we contributed to. We paid $926 per month for this coverage. We live a relatively simple life and this cost, alone, was substantially more than our monthly mortgage and property taxes combined. That said, we had insurance and were fortunate enough to afford it so we reluctantly paid the premium. We anticipated an increase in premium in 2018 so we were not surprised when we started looking at plans. We were, however, surprised that our current insurer no longer offered coverage for our existing caregivers. Thus, if we wanted to maintain our doctors we were forced to pay a much higher premium through a new insurer partnering with the Clinic: Oscar Health. The price to keep our current plan was over $1,200/month but, as mentioned, it did not offer in-network access to our existing caregivers. A plan from Oscar was slightly more than our existing plan at close to $1,300/month but it did offer access to our primary caregivers. The cheapest option we had through brokers and the exchange was close to what we were currently paying but these plans did not offer access to our doctors and offered a very limited number of providers. And, at the end of the day, we felt we were paying too much as is. We have been lucky to have good health and want to be clear we are in the fortunate position to have no significant pre-existing conditions. It’s important to acknowledge that this has put us in a position to require a very moderate level of healthcare service and no significant procedures. We are sensitive to the fact that good health is a blessing and even those with healthy habits could find themselves in a position with a significant health issue. While we are not perfect we do put an emphasis on good nutrition and workout regularly. We believe in the power of nutrition, proper sleep and exercise. That said, we understand even with those habits a significant illness could occur and we evaluated our options with that perspective in mind. This section provides a clear overview of the options we considered prior to opting to sign-up with Liberty Healthshare. At no point did we realistically consider not purchasing any coverage so we have not listed that as an option. We also never considered working for a company that offers health insurance as we enjoy our current self-employed endeavors. Continue with Current Plan from Medical Mutual of Ohio – This option would cost $1,128. The deductibles are $6,400 for a family and $12,800 for a family. It includes a HSA but is not accepted at the provider where the majority of our healthcare is performed. We could find other doctors (I am sure there are many great ones at other providers) but we have a track record with our current providers and would prefer to stay if possible. Select a New Plan from Oscar Health – Oscar is a new insurer that promises more innovative technology and a more modern approach to insurance and healthcare. They have partnered with the Cleveland Clinic, our primary provider, so this was the most realistic option if we wanted to stay with our current providers. The option we considered cost $1,289 a month for a $6,500 individual deductible and $13,000 family deductible. The plan included basic child dental care and access to an HSA. While the cost was about $150 more than our option with Medical Mutual the big draw was access to our current health providers. Select a New Plan from Caresource – A third traditional insurance option we considered was a plan from Caresource. This plan cost $911 a month for a $7,250 individual deductible and $14,500 family deductible and included basic pediatric dental coverage. While the price of this option was the most affordable of the traditional insurers it offered us the least access to providers. The network was more limited and did not offer access to our current health provider. The Medical Mutual plan we considered at least had access to a wide variety of providers, if not our current provider. Purchase Short Term Insurance Plan – I also did limited research on short-term insurance plans. These plans were offered for limited periods and were more catastrophic in nature. Beyond doing some basic diligence we did not consider these plans seriously. 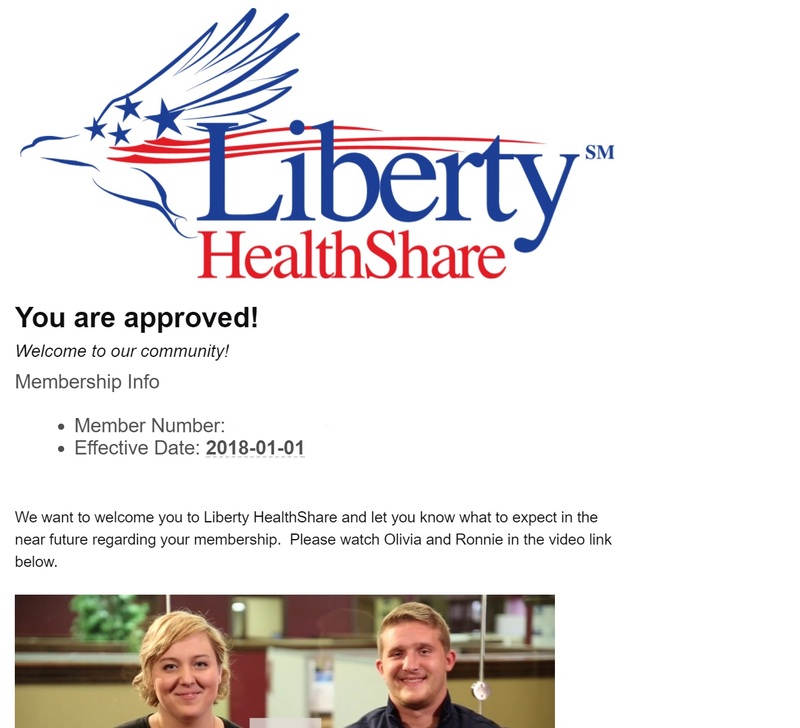 Enroll with Liberty Healthshare – The final option we considered, and the reason you are here, was Liberty Healthshare. I won’t go into a great deal of detail here because the rest of this blog includes information on Liberty and how we evaluated our decision. The purpose of this simple blog is to document our experience with Liberty Healthshare. Prior to signing up for healthcare sharing with Liberty my wife and I conducted research about the experiences of others with Liberty. It was difficult to find a detailed assessment beyond Google reviews and posts on blogs, which tended to lack a description of the entire experience and answers to questions I was interested in. When my wife and I decided to sign-up for Liberty, which we acknowledge was a risk, we decided to chronicle our experience so others can understand the details first hand. We will continue to keep this blog updated with our experience and welcome any questions you may have. We will answer those we can based on where we are in the process. We hope sharing this information is helpful to others assessing Liberty Healthshare as an option for their healthcare needs. This blog is not a place for discussion on the state of healthcare in the United States, but a fact based, independent assessment of our experience with Liberty Healthshare for the benefit of others who may be considering this option. 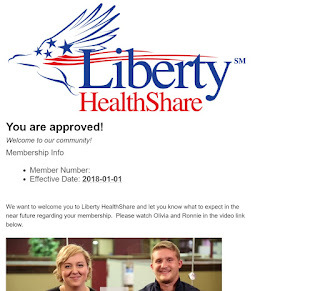 I am not an employee of Liberty Healthshare nor do I know a single person who works at the company. You will experience, our experience, as it occurs.